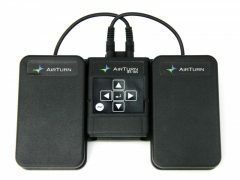 The AirTurn BT-105 Digit is a revolutionary wireless controller that combines foot pedal compatibility with handheld control. 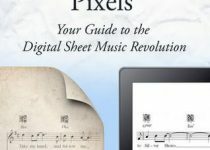 A silent, tactile button set provides the ability to turn pages, control teleprompter apps, and advance presentation slides, as well as media control for iTunes on all iOS devices including iTunes for Mac and PC, and the ability to control iOS cameras for remote video and picture snapshots. For hands free pedal control, two 3.5mm (1/8 inch) stereo ports can connect to momentary, non-latching normally open (NO) pedals and switches that replicate the handset button controls (pedals sold separately). The AirTurn BT-105 Digit features 6 silent membrane buttons, a power switch, status indicator light, 5 keyboard profiles, and an internal rechargeable battery with a mini USB recharging port. Battery life will vary, but users can expect up to 100 hours of standby usage. 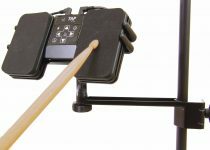 The AirTurn BT-105 Digit also features automatic Bluetooth pairing with the iPad for easy connections and fast page turns, as well as a built-in debounce filter to prevent multiple page turns for each button or foot switch press. 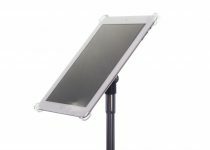 The AirTurn BT-105 Digit works with a growing number of iPad apps as well as Adobe Acrobat, Microsoft Word, PowerPoint and Keynote for PC and Mac Bluetooth equipped computers. 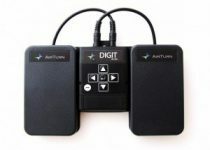 The AirTurn BT-105 Digit works with iTunes on all Bluetooth-capable iOS devices (all iPads, iPhone 3S and above, and iPod Touch), as well as iTunes for Mac and PC computers, giving users the ability to play/pause, navigate tracks, and control volume. The AirTurn BT-105 Digit will also control the camera on all camera-equipped iOS devices. The AirTurn BT-105 Digit and our silent proprietary footswitches, the ATFS-2, are all you will need to make hands free page turns. The AirTurn BT-105 Digit is also compatible with Boss FS-5U footswitches.